And it (the choice of one’s life work) is extremely important. From self-esteem and happiness to bank account and friends, factors too many to mention this morning are influenced by that choice. In fact, employment itself is determined by occupational choice! Hundreds of jobs that provided a livelihood for families 50 years ago are now a part of history. As a quick example, all I have to do is ride through my hometown and see the eerily quiet mills that were once beehives of bustling activity. I’m digressing. 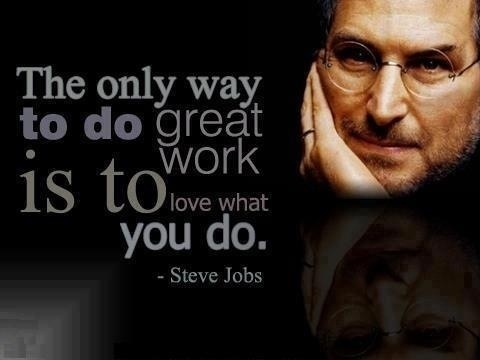 My purpose in posting this picture of Steve Jobs and his words of wisdom is to say that I believe so fervently in the truthfulness of his quote that I devoted a chapter to personal assessment and career choice in Crossing the Bridge. A job is more than a way to make a living; it’s a way to make a life. I want my readers to think of their life’s work as a vocation, not a job, and reading the first chapter will help them more clearly understand the difference. P.S. I’m experimenting with writing and posting on my iPad so please overlook the lack of Italics for the title. P.P.S. As soon as the correct version is available, I’ll post it here and on Facebook. This entry was posted in books, college students, personal choices, psychology and tagged books, careere, college students, jobs. Bookmark the permalink.